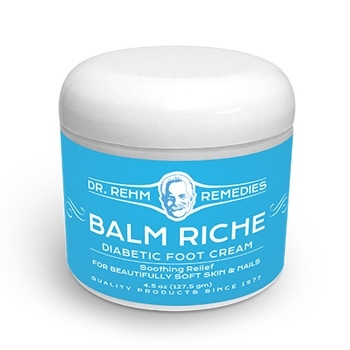 Balm Riche - Diabetic Foot Cream comes in a 4.5 oz. 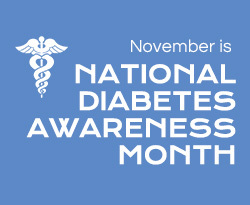 container and is formulated for diabetics to care for foot skin conditions and associated neuropathy. It helps promote optimum moisture levels of the skin, assists in healing dry skin, helps eliminate dry thick calluses, provides essential nutrients for the skin, and promotes a low friction massage to promote circulation. It also reduces inflammation, relieves dry skin, clears the skin of fungus and bacteria. In addition, it penetrates the skin, making the skin more resilient and reduces stiffness when walking. It softens skin, helps relieve pain, and promotes healthy nerves in the feet. This skin repair formula was designed by a podiatric physician and surgeon who has been assisting patients with foot concerns for over 35 years. Purified Water, Organic Aloe Vera Juice, High Oleic Safflower Oil, Extracts of Chamomile, Feverfew, Arnica, Marigold, Blue Bottle, Blueberry, Pomegranate Green Tea, Tumeric and Yellow Birch, Shea Butter Refined, Beeswax, Glyceryl Stearate, Hyaluronic Acid, Cetearyl Alcohol, Urea USP, Emu Oil, Stearic Acid, Sodium Borate, Phenoxyethanol, Caprylyl Glycol, Lactic Acid, Mink Oil, Pomegranate Oil, Tea Tree Oil, Lavender Oil, Potassium Sorbate, Hexylene Glycol, Xanthan Gum, Soy Lecithin, Lemon Myrtle Oil, Ascorbic Acid, Vitamin E Mixed Tocopherols, Vitamin A Retinyl Palmitate, CoQ10. Formulated especially for the person with diabetes as part of their daily foot care regimen for skin AND NAIL management. Use daily to Massage WELL into feet or after using Balm Riche™ Cleansing Redi-Pads. Do not apply in-between toes. Wipe excess off. Nunc pretium quis sapien eu rhoncus. Suspendisse ornare gravida mi, et placerat tellus tempor vitae. 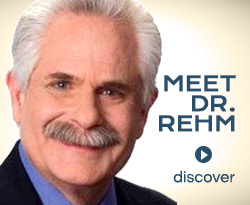 © Rehm Remedies All rights reserved.